Our range could not have been created without the precious collaboration of doctors and experts during the product development stage. Right from the beginning of this adventure, we decided to surround ourselves with a Scientific Committee, the members of which come from some of largest institutions involved in combatting cancer including the Centre Léon Bérard (Lyon) and the Institut Gustave Roussy (Villejuif). It is composed of oncologists but also an onco-dermatologist and a nurse specialised in organic aesthetics. The aim: better understand your needs so that we can meet them as effectively as possible. And because you deserve complete transparency, it was essential for us to clinically test our products before making them available to you . Our multicentre clinical trial on 70 women undergoing cancer treatment took place in 2016 at the Léon Berard Cancer Centre and Jean Mermoz Private Hospital in Lyon, France. 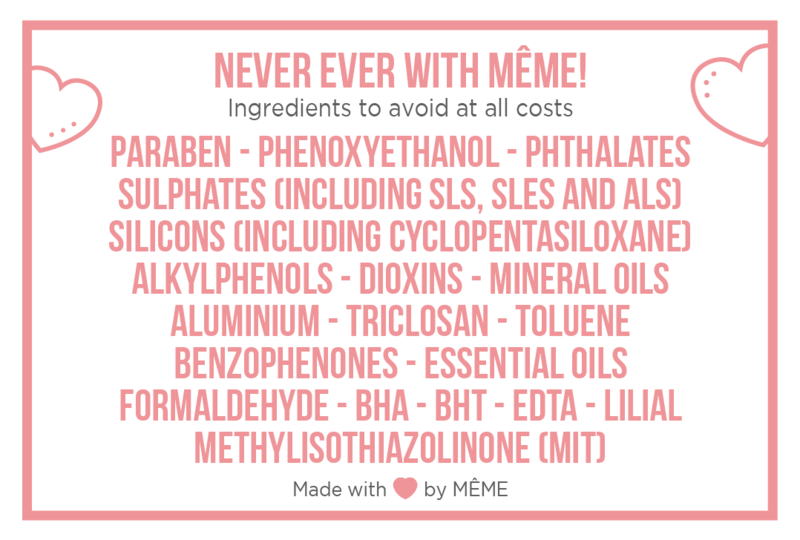 Download our "NEVER EVER WITH MÊME" pocket list to learn how to recognise theses ingredients, which don't want to hear anything more about, to help you protect yourself and those that you love! We are convinced that helping you to find your femininity again will allow you to build up your self esteem to be psychologically stronger and better fight the disease. That is why we have developed, just for you, pretty products and beauty rituals that are gentle and ensure your well-being.